Former Rail Minister Andrzej Massel. Photo Shalom. 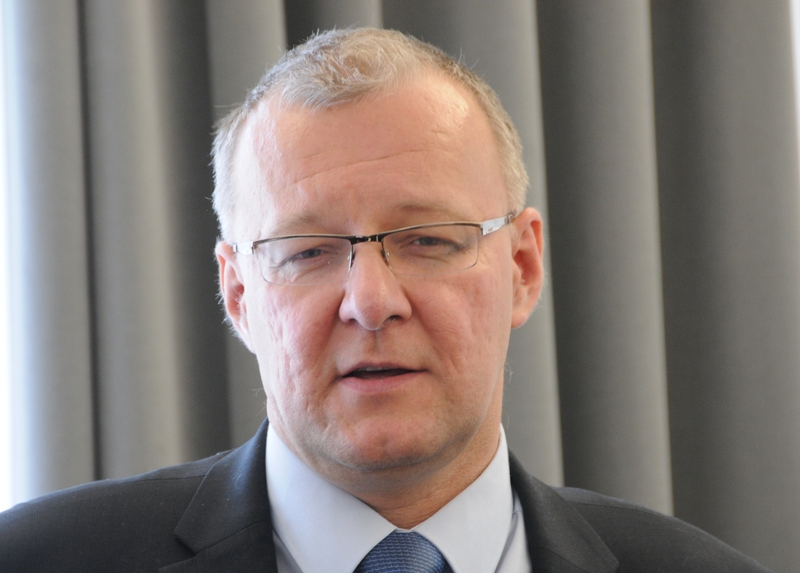 BTWT has been told by sources close to the Ministry of Transport the reasons why the Undersecretary of State responsible for Poland’s railways was sacked by Elzbieta Bienkowska, the new Infrastructure and Development Minister – he was too pro rail! Apparently, the Polish government has been trying to wriggle out of the EU Commission’s requirement that 60% of the next tranche of EU transport infrastructure funding should be spent on rail. Polish government negotiators have been claiming that there was no way that Polish railways could use all the funds and that most of the funding should be spent on road building. Massel broke ranks and told European Commission officials that Polish railways could use all the funds. So he was sacked. Szczecin.gazeta.pl – Dobre wieści z Brukseli: Europa da pieniądze na dokończenie drogi S3 i kolej do Wrocławia. Under Pressure, Elzbieta Bienkowska, Minister of Regional Development. From a photo by Piotr Drabik. 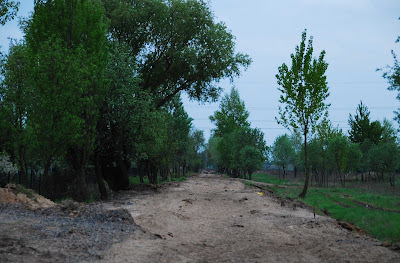 The European Commission has blocked the repayment of funds due to Poland for EU-assisted road building projects under the auspices of the Infrastructure and Environment programme and Eastern Poland development program. The reason for the stoppage is a court case that has been running for several months into the behaviour of ten road construction company bosses and a senior director of Poland’s Trunk Roads Directorate, the GDDKiA. The accused face charges that they formed a cartel which affected the tenders for sections of the S8 expressway and a section of the A$ motorway. European Commission officials have demanded that Poland withdraws its refund applications for the tenders which are the subject of the court proceedings, puts in place an urgent investigation into its control procedures, and undertakes urgent checks to see whether any other tenders could have been effected to similar illegal price-fixing agreements. Some 3.5 billion PLN in EU refunds are stopped, that being the sum of monies due to Poland that are ‘in the pipeline’. If the stoppage effects projects for which Poland has not yet submitted the refund applications the sum could be much higher. On Friday 1 February, Infrastructure Minister, Slawomir Nowak, and Regional Development Minister, Elzbieta Bienkowska, came back from consultations with EU officials in Brussels and declared that they expect the EU stoppage to be lifted soon. Others are less optimistic – other EU investigations are under way could effect even more refunds. If matters are not resolved by May the GDDKiA could become insolvent. D1 Combino tram at Melbourne Town Hall. According to the Economist Intelligence Unit’s last Liveability Ranking and Overview Melbourne is the best city in the world to live in while Vienna comes a close second. London trails a long way behind and is ranked as the 55th most ‘liveable’ city in the world. The Economist’s methodology is somewhat subjective – members of the EIU panel award points for such factors as crime levels, education, health care, culture and infrastructure – and then multiply the points by a weighting predetermined for each factor. 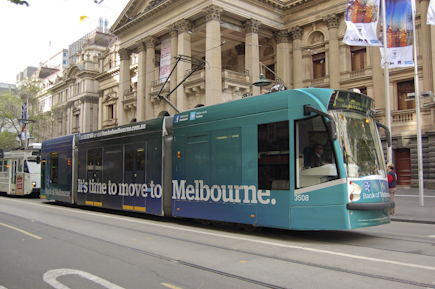 However, it is noteworthy that, at 250 km, Melbourne has the largest urban tramway network in the world. Melbourne is the only Australian city that defied the general Australian trend of scrapping its city tramways. The retention of its tram network is due to determined opposition by the trade unions, the general public and the vision of the chairman of the Melbourne and Metropolitan Tramways Board, Sir Robert Risson. Great Britain – which liquidated its tramways in the 1950s – had no Sir Roberts, and has no cities in the Economist’s top 50. Manchester, at number 51 is Britain’s most ‘liveable’ city according to the study. Could it be a coincidence that Manchester started building a new tram network in 1988 and is actively expanding the system, partly by building new ‘inter-urban’ extensions on former ‘heavy rail’ lines? Finally, by way of proof that trams and ‘liveablity’ go together, the Economist’s second best choice is Vienna. Vienna has a thriving tram network. Currently the city fathers have a policy of replacing tram lines in the city centre by traditional metro – somewhat similar to the current trend in Warsaw. However, what with the with the slow pace of Metro construction, its cost and the financial crisis, trams are likely to retain a key role in both city’s transport systems. How do Polish cities fare? Unfortunately, the complete rankings are not provided in the brief FOC ‘summary’ and the full reports cost many thousands of Euros. If any BTWT reader has read any of the full EIU Liveability reports and knows the rankings of Polish cities, do please share them with us. 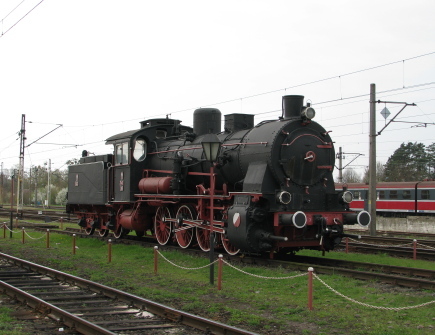 Warsaw Railway Museum Tp3-36 plinthed at Zbaszynek, built by Hanomag in 1913 as Prussian State Railways 4832 (4804 after 1920) renumbered by DR as 55 2199 in 1925, taken into PKP stock in 1945 and withdrawn from service in 1970. Photo BTWT. The Wolsztyn Steam Parade has just taken place (29 – 30 April), but I gave the show a miss this year. 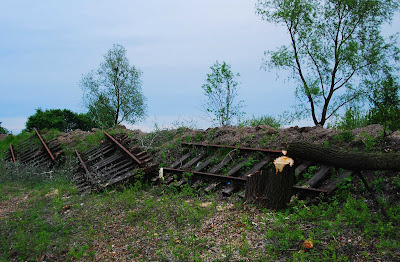 There is an element of artificially about the event which I do not like, and – with the Smigiel Railway closed – a large part of the reason for making the annual pilgrimage to this corner of Wielkopolska has evaporated. I heard through the grapevine that this year for the first time PKP Cargo had arranged to bring its VIP guests from Warsaw by motor coach rather than train – a decision which speaks volumes about the sad state of Polish railways. PKP Cargo operated, Warsaw Railway Museum owned, Pm 36-2 pacific Piekna Helena (Fablok 1937) just coming off the 11:13 arrival (10:41 ex Wolsztyn) at Zbaszynek on 16 March 2011. Photo BTWT. Instead of visiting the Steam Parade at the end of April I travelled to Zbaszynek a fortnight earlier to ride on the regular Zbaszynek – Wolsztyn – Leszno steam turn. (The steam service has been relocated to this line while the Wolsztyn – Poznan track is upgraded.) While waiting for the arrival of the morning steam turn from Wolsztyn there was time to admire the ex Prussian Railways, Tp3-36 plinthed opposite the old railway works at Zbaszynek. 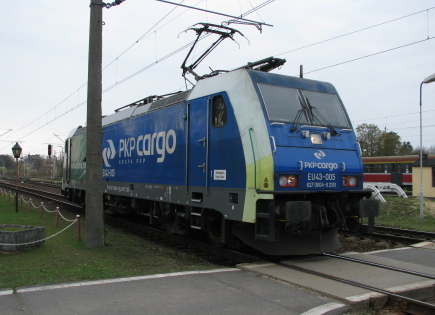 PKP Cargo EU43-005 (Bombardier TRAXX 2007). Photo BTWT. Within a minute of seeing PKP Cargo’s oldest operational locomotive arrive at Zbaszynek I was treated to the sight of its newest loco travelling ‘light engine’ in the opposite direction. The Pm36-2 is kept in spotless condition. Photo BTWT. While Pm36-2 is kept in immaculate condition, sadly the same cannot be said of its pair of ‘double decker’ coaches which were very dirty and in poor condition. Justifiably they are not very popular with local residents and are due to be replaced by overhauled ‘single decker’ coaches from the New Year. 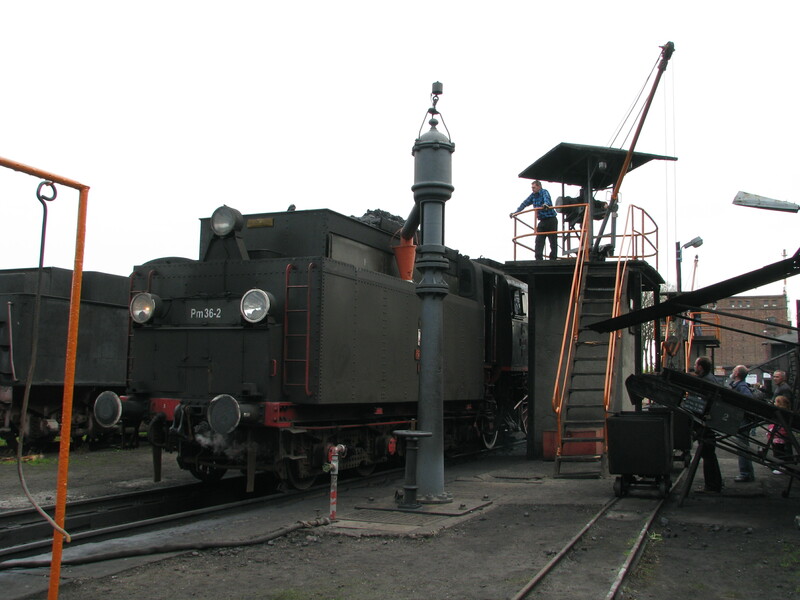 With no operational turntable at Zbaszynek the the Fablok pacific suffers the indignity of working its train tender-first as far as Wolsztyn. Pm 36-2 is coaled… Photo BTWT. 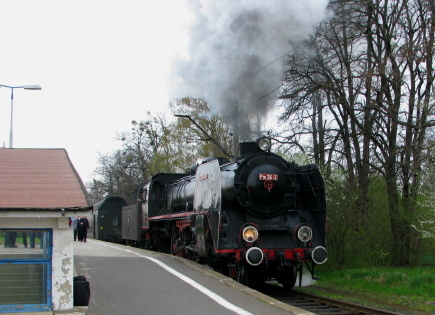 The Przewozy Regionalne Osobowy 11:50 ex Zbaszynek arrived in Wolsztyn at 12:35. Here I cadged a lift on the footplate as far as the shed where the engine was coaled, watered and turned. 55 minutes later, Pm36-2 and its two ‘double deckers’ continued their journey as the 13:30 ex Wolsztyn Osobowy arriving in Leszno at 14:35. 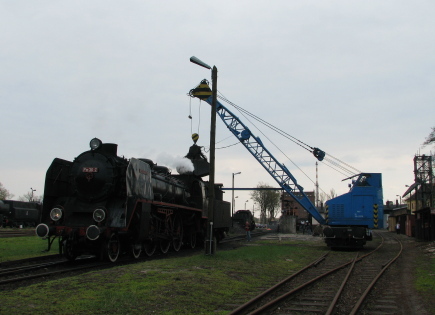 …and having been turned on the Wolsztyn turntable is watered. Photo BTWT. 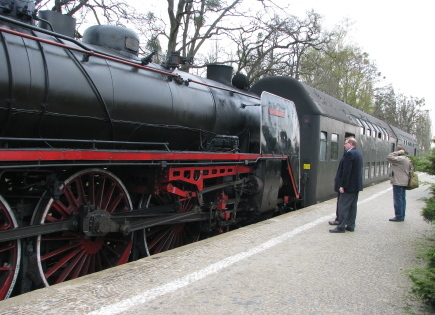 With 75 kilometre trip from costing only 15.60 zloty (about £3.40) the Zbaszynek to Leszno journey must be the best value steam-hauled trip in Europe. Checking Pm36-2’s motion. Photo BTWT. 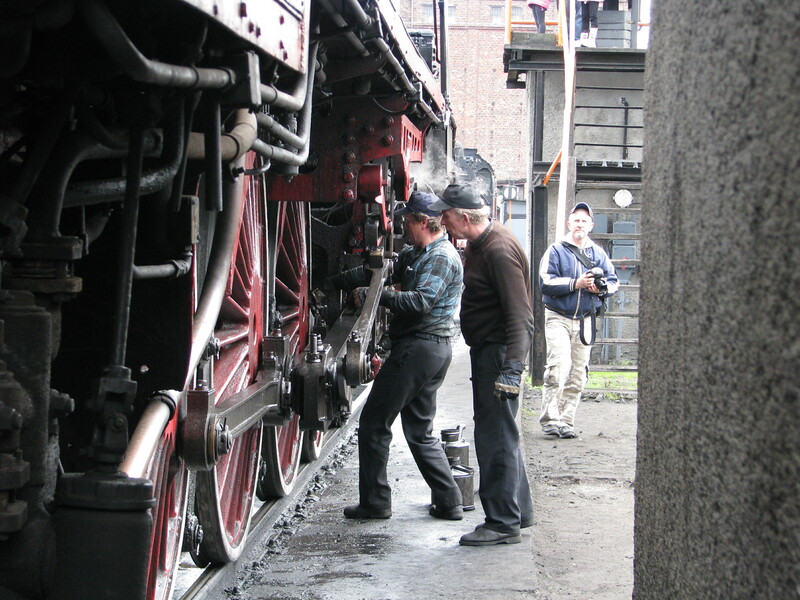 After the loco is coaled at Wolsztyn shed a new crew take over the engine for the rest of the journey to Leszno. Their first duty is to check the bearings and oil the engine. Lady at a tram stop in Amsterdam. Photo Alan Colville. On Saturday, I saw a lady waiting in a tram stop. She was alone, preferring to wait in quiet meditation rather than to be part of the scrum waiting at the bus stop. Unlike the lady in the picture above she did not look anxiously over her shoulder to see if a tram was on the way. She knew that if she waited long enough the tram would come. Rail transport – be it a city’s tram system or a nation’s railway network – provides our information-overloaded minds with a reference grid, a stable element in a confused world. It was railways that first unified Britain’s time keeping. In November 1840, the Great Western Railway ordered that London time should be used in all its timetables, and at all its stations. On 2nd August 1880 the rest of the country followed suit. Railway networks also provide a convenient navigational grid. Just like migrating birds following rivers, I still refer to my mental map of London’s canals and railways when crossing the great city and delight in exploring new links such as the Croydon Tramlink and Docklands Light Railway. No wonder then that so many of Britain’s heritage railways started with ambitious plans to restore what had been taken away – to operate a transport service for the local community. Sadly most were forced to cut down their ambitions when faced with mounting obstacles put in their way by BR and the mandarins at Marsham Street. The importance of railways as a uniting force is understood by governments. Hitler planned the Reichsspurbahn – a new broad gauge network to help him retain a grip on Großdeutschland the greater Germany that was supposed to arise after he won WW II. The opposite is also the case. The current disillusionment with Westminster-style democracy has its origins in the Beeching Axe – the wholesale dismemberment of Britain’s railway network which took place without any reference to Parliament. Poland’s politicians planning further rail cuts please take note. Is it any coincidence then that the UK Prime Minister has chosen to announce an 8-year railway electrification programme at a time when his popularity is in meltdown? Sceptics will ask why the benefits of electrification were ignored during the last 12 years when the Labour party were in power. And the lady at the tram stop? Well she’s probably still there. The trams were suspended and replaced by buses some two weeks ago when a programme of track repairs commenced. With the all UK mainstream media and much of the UK blogsphere focussing on MPs expenses and the resignation statement of House of Commons Speaker, Michael Martin, Behind The Water Tower cannot entirely ignore the matter, so if – in spite of the everything already published – you still want to read more about MPs and Michael Martin, just skip to very end of this post for a few links to some material that you may have not yet read. Now back to railways. It seems that only The Railway Eye and Behind The Water Tower consider the report on Rail Franchising by the House of Commons Public Accounts Committe worth reporting. Though railways have not escaped completely from the media’s gaze. The Guardian reports that 2.2 million railcard holders such as students and pensioners face fares rises of up to 50%, while The Daily Mail predicts that 1.6 million train travellers face misery because of line closures during the bank holiday weekend. Incidentally a year ago, we reported on the complexity of UK rail fares and that only the Internet-savvy could find good deals. It is encouraging to see that the Public Accounts Committee has come to the same view. Here is the Conclusions and recommendations section of the Committee’s report. If you want to download the full report, just click on the picture at the head of the article. Since taking over from the Strategic Rail Authority, the Department has shown itself capable of letting rail franchises to the planned timescales and protecting the taxpayers’ interests. The Department has procured passenger rail services that live within the public funding available and improve railway performance, although passenger satisfaction continues to pose problems. The Department cannot be complacent and should provide regular analysis and assurance to demonstrate that rail franchising developments are consistent with the Government’s wider objectives. The Department does not consider damaging side effects for passengers from its rail franchising approach. The Department sets requirements for service frequency and punctuality but does not, for example, measure the impact of rising car parking charges, complex fares and crowding on travellers, including on vulnerable members of society. Although the Department consults widely, regional transport bodies are not involved in selecting the bidder who will operate services in their area. The Government plans an increased emphasis on a local approach to transport decisions, with Integrated Transport Authorities providing oversight to a number of Passenger Transport Executives in the regions. The Department should invite local and regional bodies to second suitably qualified staff to join the Department’s bid evaluation teams so that details of the services, as bid, are checked against local needs. The present economic crisis may well put additional pressure on the commercial skills of the Department’s staff. The Department’s franchise management and monitoring will only be effective if there are enough staff in post with the necessary skills to interpret and question financial and commercial information. The Department should be flexible in its recruitment, remuneration and use of staff with commercial experience. Pressure to reduce administrative budgets should not undermine its ability to negotiate effectively with train operators. The Department promises of bringing 1,300 new rail carriages into service by 2014 look over-optimistic. There are only 423 on order so far, and another 150 carriages are the subject of negotiations. It takes 30 to 36 months to mobilise the supply chain, suggesting deliveries running into 2011–2012 for the current work in progress. It is unacceptable that low cost fares, which should be available to all rail passengers, are most readily found by those with access to the Internet. This approach undermines the whole basis of the railways as a public service available to all. It excludes those people without access to the Internet, without the time to search or who decide to travel at short notice. There is no reason why the Department should favour a system which supports such perverse and unwarranted exclusion. The Department must do much more to simplify fares. The Department has made a start in simplifying fares, but some complex fares still exist and the best fares are hard to find without access to the Internet. Fare structures should be simple, fares should be accurately named, and the lowest priced fare for a journey should be publicised and readily available at station ticket offices, as well as on the internet. In the economic downturn, the Department intends to hold train operating companies to their financial commitments. The Department hopes that, by 2010– 2011, direct subsidies to train operators will be eliminated as companies increase their revenues. But the recession may trigger a reduction in rail travel and fare revenues, and some train operating companies may ask the Department to relax their contractual obligations. The Department should hold train operators to their contract terms although, in some cases, including National Express’s bid for the East Coast franchise, the original bid might have included over-optimistic revenue assumptions. In the short term, there is an increased risk of train operator financial failure. Although the Department has effective arrangements for monitoring the operational and financial viability of train operating companies, there is a risk that some companies could fail as their revenues fall. In some cases problems that are temporary in nature will be managed through parent company support for additional bank finance. The Department should explore all options and develop robust contingency plans to keep train services running in the event of multiple failure. In the short term, there is also an increased risk of financial failure by banks that have issued performance bonds. The Department requires train operating companies to issue performance bonds, backed by banks, which the Department can call in the event of the failure of a company. The bonds cover about 5% of the annual cost base of each franchise holding company and have been issued by a selection of banks. The Department should review the ability of the issuers of performance bonds to respond to a call as often as necessary, potentially even on a daily basis. It is not parliamentary language to accuse a UK government minister of lying, so instead BTWT accuses Tom Harris of ‘being economical with the truth’. A host of press articles in May about a new high speed line from London to the North gave rise to speculation that the UK government might at last be about to commission a feasibility study for the new line. BTWT bided its time before commenting, waiting for a signal as to the government’s intentions. Now Mr Harris has given that signal and it is firmly fixed in the stop position. Yesterday’s Times reports. Despite repeated promises to consider the benefits of a dedicated new line capable of carrying passengers from London to Scotland in less than three hours, ministers are thinking again. Mr Harris was responding to an appeal by Chris Davies, the Liberal Democrat MEP for the North West of England, asking the Government to make its position clear. Mr Davies pointed out that France had already built 1,000 miles of 190mph line, was planning another 500 miles and was considering raising the top speed of trains to 225mph. Mr Harris’s comments contrast sharply with Labour’s 2005 election manifesto, which pledged to “look at the feasibility and affordability of a new North-South high-speed link”. The fallacies on which Mr Harris’s conclusions are based were quickly pointed out by Chris Davies. A high-speed train produces about 90 grams of carbon dioxide per passenger-kilometre, compared with just over 50g/km for a conventional electric train. But a domestic flight produces 225g/km. Inter-city lines are severely overcrowded and there is strong evidence that future demand has been underestimated. The total distance travelled by train is growing by about 10 per cent a year, but over the next five years the Government is planning to increase capacity by only 22.5 per cent. In January Iain Coucher, the chief executive of Network Rail, told The Times that by 2020 Britain needed at least three domestic high-speed lines to add to the 68-mile link between London and the Channel Tunnel. Richard Brown, the Chief Executive of Eurostar, also added his weight to the debate in a letter published yesterday in The Times. Sir, Any useful assessment of the environmental benefits of high-speed rail must rely on far more than a simplistic comparison with the energy consumption of conventional trains (“High-speed rail travel is not a green option, say ministers”, June 6). To start with, no one except the Government is proposing that future high-speed trains would operate at 350km/h (217mph). The current European maximum is 300km/h (186mph) with an emerging consensus that 320km/h (199mph) is the practical maximum in future — so the increase in energy would not be as great as the Government suggests. Secondly, the actual passenger load factor on Eurostar services is twice as great as that assumed for high-speed trains in the recent rail White Paper, thus halving the Government’s estimate of energy use per passenger journey. Furthermore, high-speed rail has a proven record across Europe of enabling very significant modal shift from plane to train, delivering a vast saving in carbon dioxide emissions generated by people who would otherwise fly. Research has shown that a Eurostar journey generates less than one-tenth of the carbon dioxide emissions of an equivalent flight. Electric trains can also be switched to even lower-carbon sources of electricity as soon as these become available under the Government’s energy plans, unlike aircraft and road vehicles which are likely to remain very largely wedded to fossil fuels for the foreseeable future. Finally, any assessment of environmental impact should also be based on the next generation of high-speed trains, which are about 25 per cent more energy-efficient than current fleets such as Eurostar. With domestic main lines running out of capacity, and with the current rapid expansion of the continental high-speed rail network, the case for further high-speed lines in Britain should be properly and fully investigated. If you live in the UK and feel as strongly as we do that the UK is the railway Cinderella of Europe, perhaps you could write to to your own MP, pointing out the fallacies in Mr Harris’s comments, and asking them to obtain details of the basis on which Mr Harris made his extraordinary claims? You can obtain your MP’s name and address as well as all sorts of other interesting information from TheyWorkForYou. You may also enjoy playing with L’EcoComparateur, a very nice CO2 emissions calculator for different transport modes. Sadly, it doesn’t do London to Warsaw just yet and, in fact, seems to work best when the journey originates or ends in France. On 25 June, the International Union of Railways is running a workshop to launch the ‘UIC Eco-comparison tools for European routes‘. Perhaps UK Transport Minister, Ruth Kelly, should make sure that Mr Harris attends. Does the left hand know what the right is getting up to? The Commission first warned Poland about the need to upgrade its laws in 2005, a year after the country joined the EU. The then left-wing government made some changes but, according to recent EU audits, they were not adequate. The Commission blocked some 800 million euros from a 2004-2006 budget because of the problem. Polish officials have said the country has so far submitted many projects for EU approval in line with its environmental requirements although these have not been mandated by Polish legislation. This has allowed Poland to make use of about 75 percent of EU funds for 2004-2006 but the Commission was growing reluctant to give conditional go-aheads for projects, Huebner said. “Unless there is an acceleration on the part of Poland, the threat will grow” she said. One of the idiocies of the current legislation is the owner of a private railway siding used for freight is liable to local tax, but if the he rips up the siding, covers it in asphalt and uses lorries to transport materials in and out, his new road is not subject to any cuts. Poland has seen a wholesale scrapping of private sidings and the last sugar refinery railway was lifted a few years ago. So while the Polish government spins its environmental credentials, what is really happening in the ground? Read Mike Dembinski’s timely article below, which was originally posted on 3 May on the Wwa-Jeziorki blog. This evening I had the greatest shock I’ve experienced in our six years of living in Jeziorki. Scrambling to the top of the aggregate line embankment to suddenly realise – the tracks have been ripped up. Compare with photo taken ten weeks ago. Removing the tracks seems to run counter to today’s environmental trends – rail should be replacing road for the transport of bulk freight. This is a sad sight for railway enthusiasts. Once torn up, they’ll never come back. The speed and scale of the operation has amazed me; it was not long since my last walk here. The tracks have been thrown down the side of the embankment and the sidings below also ripped up. 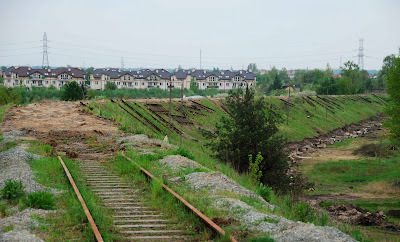 Below: Looking towards the buffers at the Nowa Iwiczna end of the line. Compare with this view taken ten weeks ago. Looking up at the embankment gives one the impression of scorched earth – vandalism on a monumental scale. What will happen here? Will the rails be replaced by asphalt, allowing trucks to bring aggregate to the Jeziorki depot? Will this be a new local road, enabling the residents of the new housing estates of Nowa Iwiczna and Mysiadło to by-pass the totally congested ul. Puławska? One thing is certain – a killing will be made on the scrap rails. I did some checking online. The site is owned by Warszawskie Zakłady Eksploatacji Kruszywa (WZEK Sp. z o.o.). Its registered commercial activity, last amended on 7 November 2005, is ‘real estate’ and ‘trans-shipment of cargo’, in that order. My brother speculates that this sizeable piece of land, right next to a suburban railway station, would be prime property for a developer. Warsaw City Hall has given planning consent for connecting the WZEK site to the main sewers running down ul. Karczunkowska on 12 November 2007, but I can’t find anything relating to ripping up rails or change of land use. UPDATE: 11 May – most of the rails seen strewn down the embankment have been removed. This is not just a matter of scoring a debating point against a fat cat. McAllister’s lack of concern over the Rugby incident in the first place, when he told the Daily Mail that he would just be in the way if he went into the office during the holiday break, suggests that neither taxpayers nor the railway are getting much benefit from the £250,000 he is paid annually. McAllister’s failure to recognise the PR damage he caused is illustrative of the arrogance that permeates the company culture. While things have undoubtedly improved since the Railtrack days when the company alienated not only passengers but the whole of the rail industry, there is still little recognition among its bosses of the hugely privileged position they are in, given that Network Rail is a monopoly funded by almost endless amounts of government cash. Rugby and subsequent events have raised very fundamental questions about the future of Network Rail. The fact that the only way to discipline the company is through fines whose only effect is to reduce the amount available to invest in the industry has not been lost on ministers. Network Rail is one more debacle – either a similar major overrun or an accident – from attracting a thorough investigation of the way that the industry is structured and Network Rail’s role in it. Watch first, though, for McAllister’s quiet departure in the next few months. When will those trains run on time? Ever since the mid-1970s, when I was the Financial Times‘s transport correspondent, a question has troubled me: why have Britain’s politicians, almost alone in western Europe, failed to create the conditions in which railways can thrive? Now, as the rail system lurches from crisis to crisis, and as the Commission for Integrated Transport reports that Britain has the worst commuter congestion and very nearly the highest rail fares in Europe, the question troubles me more than ever. To get at the answer, three periods demand examination: James Callaghan’s union-accommodating social democracy of the 1970s; Margaret Thatcher’s union-bashing neoliberalism of the 1980s, to which John Major added a coda in which the railway was privatised; and, finally, new Labour. The differences between these political eras could scarcely be more marked but, for the railway, the outcome has been the same – stagnation. Between 1975 and 2000, rail’s share of passenger journeys fell from 8 per cent to 6 per cent, despite the soaring demand for travel in general. What went wrong in the 1970s is pretty clear. The Callaghan government failed to gain mastery of either the public finances or the trade unions, both critical factors for the railway. Callaghan’s transport secretary was Bill Rodgers, later a founder of the Social Democratic Party, and British Rail was chaired by a top businessman, Peter Parker. Parker brought TV advertising to BR, with Jimmy Savile’s “Age of the Train”. 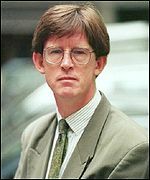 However, his marketing successes were undermined by labour disputes and management failures. A sorry symbol of the era is the tilting, 140mph Advanced Passenger Train, designed to cut long-distance journey times on Britain’s bumpy, bendy track. Plagued by engineering faults, it was cancelled in 1981 at Treasury insistence, after 14 years and £40m. There was a more fundamental problem, common to the Callaghan government and all its successors. Whatever the rhetoric, no government has behaved as if the railway was really capable of increasing capacity and so taking pressure off our ever more congested and environmentally damaging roads. Probably Parker’s biggest achievement was his success in persuading Margaret Thatcher, who did not travel by train, that he should be succeeded by his own chief executive, Bob Reid, a career railwayman. Reid promptly made friends with Nicholas Ridley, transport secretary from 1983-86. It was Ridley who convinced Thatcher to keep the railway off the privatisation list. Reid also had the good fortune to run BR at a time when Thatcherite belligerence encouraged the unions to keep their heads down, and when the Lawson boom was doing to railway demand what booms always do – making it grow. This growth was kept in check by the Treasury’s well-practised trick of insisting that BR push up its ticket prices above inflation, which had for the Exchequer the pleasant double effect of reducing subsidy and undermining any proposals to invest in greater system capacity. That is why the 1980s ended with the railway run down, but financially in better shape than at any time since nationalisation. 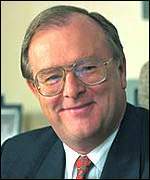 Many critics of rail privatisation – including John Prescott, who, after shadowing transport, took overall responsibility for it in 1997 – saw Reid’s period as a golden age which demonstrated that nationalisation was on the point of proving itself. In reality, the golden age rested squarely upon Crosland’s self-limiting assumption about the sensible little railway. Nobody in government, then or later, tried to design a railway capable of soaking up extra demand from choking roads. Privatisation – which, if properly designed, might have eased the investment shortage – gave incentives to the train operators to win more business, but denied them to Railtrack. Incredibly, the possibility of growth was raised nowhere in the tonnes of privatisation documents and consultants’ reports that preceded privatisation. Everyone assumed that the sensible little railway would stay small or get smaller. You had only to look at routine transport statistics to see the folly of this. I still have a piece of paper Gerald Corbett, then chief executive of Railtrack, gave me in 1998. It shows demand rising from 27 billion passenger kilometres a year in 1982 (recession) to 34 billion in 1989 (the Lawson boom). Demand then falls in the recession of the early 1990s, picking up for the subsequent boom, the longest since the Second World War. By 1996, when Railtrack was floated on the stock exchange, demand was very nearly back to its peak of the Reid years. So, if you believed the economic forecasts of Kenneth Clarke, then the Chancellor, you knew that it would soon be well above it. By 1999, passenger demand was indeed up by one-third from its low point, and freight traffic by nearly 40 per cent. Because it was unforeseen, this increase in demand had not been matched by increased investment. It was this miscalculation that imploded after the Hatfield derailment in October 2000 as speed restrictions aggravated the system’s countless bottlenecks. Corbett’s figures envisaged the possibility that, by 2007, demand could reach 45 billion passenger kilometres, an increase of almost 60 per cent on the level assumed at privatisation. Yet the railway was neglected as wantonly by Tony Blair in his first term as it was by Thatcher during hers. Blair’s lack of commitment is illustrated by the seriousness with which he took the job of transport minister. In the past 20 years, we have averaged one transport minister a year, and Blair, famous for his reluctance to shuffle the cabinet, has exceeded the average. It is also evident that the railway has been damaged by infighting between Prescott, Downing Street and the Treasury. Dismissed as dangerously anti-motorist by the Downing Street “teeny-boppers”, Prescott was made a monkey by the Treasury in his attempts to devise a way forward for the London Underground and to see beyond the design flaws in the privatised railway. Just recently, the Commons transport committee protested about the Treasury’s refusal to give evidence on Railtrack. That fits a pattern. Bob Kiley, Ken Livingstone’s director of transport in London, complains that he has failed to secure a single meeting with Gordon Brown. So does Sir Alastair Morton, the outgoing, highly experienced business operator brought in by Prescott to run the Strategic Rail Authority. In Morton’s view, the culture of the Treasury is deeply implicated in Britain’s railway problem. “It’s a culture that is averse to investment. The Treasury manages the economy for cash. Historically the Treasury has always regarded the cancelling or reinstating of capital projects as one of its major regulators of the cash flow of the economy. The Treasury does not have the concept that you invest for the long term.” In other words, to see what Britain run by the Treasury would look like, imagine yourself on any railway platform any day since 1948. Treasury short-termism and cabinet factionalism remain central to the railway problem. The railway will prosper only if the cabinet can agree that it needs to grow and, as this growth will not be self-financing, that it must be supported by long-term public or government-guaranteed capital. This is an industry where assets last for decades. Have you ever wondered why British and American railways get such a raw deal from their governments? A question that’s very relevant in Poland as the Government here seems determined to copy the UK’s disasterous privatisation. There’s tons of stuff published on what’s wrong with our railways, but precious little on why they are so underfunded and mismanaged in the first place. I don’t always see eye to eye with Christian Wolmar (see photo), the UK’s most famous railway pundit, who tends to focus on technical and managerial issues, rather than the political environment within which decisions on the future of our railways are made. However, in republishing the core of Alex Marshall’s article King of the Road on his blog, he has done a great service to those of us who argue that rail transport deserves a greater slice of the transport budget cake. So in case you didn’t read either version, I’m republishing Christian’s article here. Why are roads favoured by the right and trains by socialists? An article on an American website asked a question which has long intrigued me: why does the Right favour roads given they require a massive subsidy from the state as well as the direct intervention of government in order to be built, and yet is suspicious of public transport spending? The article, by Alex Marshall, argues that building roads is a manifestation of state power and that they require some $150bn of state funding annually, enough to wage a war on Iraq. Marshall points out that a whole host of right wing think tanks in the US lobby strongly for increased spending on roads, while simultaneously trying to kill off public transport systems, arguing they are inefficient and expensive. In trying to work out why the Right He asks a leading lobbyist, Robert Poole, why his Reason Foundation supports roads given its general dislike of government involvement. Poole is completely flummoxed: “I’d never thought about it that way”, he says, and is unable to give a coherent answer, arguing that they are not anarchists seeking to allow anyone to build competing roads everywhere. I remember asking pretty much the same question of Digby Jones at a press conference when he was head of the CBI. I questioned why the CBI was always asking for more money to be spent on transport when generally it was constantly lobbying for reduced government spending.Much to my pleasure, he totally lost his rag and spoke for 10 minutes without really answering the question. There is indeed a contradiction. As Marshall points out, ‘our national road system would never have been built if every street were required to pay for itself’. Indeed, one could argue that many small country roads are totally uneconomic by any criteria and should be closed down, in the same way that railway branch lines should be shut. Or they should be allowed to decline with no maintenance, leading to the imposition of 20 MPH speed limits, as happens on little used parts of the railways. More widely, though, Marshall raised a fundamental point. What is it about roads that attracts the Right? Surely they must, by now, realise that the freedom afforded by the car is illusory, since, as usage rises, the extra societal costs of more people getting on to the road outweigh by far the benefits. And the simplistic view that roadbuilding is the answer has been widely discredited. There is a gaping intellectual gap in the Right’s thinking which environmentalists and public transport supporters should be more adept at exploiting. Too see the interesting comments spawned by Christian’s article you’ll have to go back to the original.